Editor’s Note: MSJDN asked its members to help us spotlight employers that are going above and beyond for military spouse attorneys. Each employer in this series was nominated for MSJDN’s Members’ Choice Award for doing just that, by members who told us in their own words about the awesomeness of their employers. MSJDN is thrilled to tell these employer stories as a way of expressing our gratitude for supporting military spouses as they build careers in the legal profession. The MSJDN Members’ Choice Award recipient will be announced at MSJDN’s Annual Reception in Washington, D.C. on May 6. We are close to the end of April and the last of our Members’ Choice nominees, but we still have some wonderful stories of support and mentorship to share! Today we are shining the employer spotlight on Ginger Jacobs, a partner at Jacobs & Schlesinger LLP in San Diego, California. Maria Chavez, the MSJDN member who nominated Ginger for the 2015 MSJDN Members’ Choice Award, has been an attorney at the firm sin ce Fall 2014. Maria is also an attorney with UURISE, Inc., a non-profit organization providing immigration legal services. The flexibility offered by Ginger and the firm, allowing Maria to pursue her career and her passions in two different outlets, are just one reason for the nomination. Jacobs & Schlesinger has not one but two military spouse attorneys working with them. Maria says that Ginger is “an amazing role model” and we agree! Her support for military spouse attorneys sets the standard for other practitioners to follow when it comes to employment of military spouses in the legal profession. Finding a good mentor can help lawyers, and especially military spouses, navigate the ups and downs of a legal career. But finding that mentor can be a daunting challenge when relocating to a new town where fresh connections have to be made from scratch. Maria praises Ginger for her mentorship and support of military spouses looking to break into immigration law. 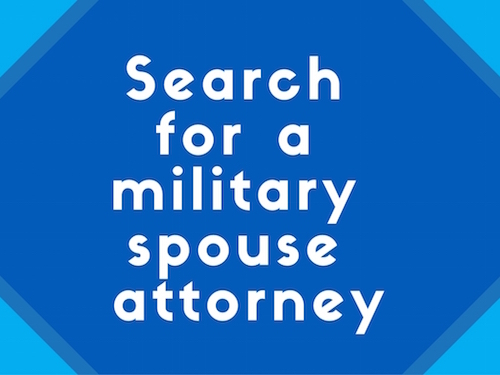 Ginger often receives requests from military spouse attorneys and takes the time to point them in the right direction and connect them with contacts in the local legal community. She invites them to CLEs and takes time out of her busy days to have lunch with them. Ginger’s willingness to share her time and experience makes a meaningful difference in the lives and careers of these military spouse attorneys, as recognized by Maria’s nomination. In addition to the mentorship Ginger provides to military spouse attorneys outside of her firm, Maria is also fortunate to have an excellent boss in the workplace. “She knows and understands that my husband’s career can sometimes dictate my schedule, and she has proven that she will be flexible and “roll with the punches” that happen with military life,” says Maria. Supportive employers like Jacobs & Schlesinger help reduce the career barriers faced by so many military spouses. MSJDN is extremely grateful for Ginger and the time she has dedicated to military spouses in the legal profession. Ginger and her firm are shining examples to other organizations in all fields of the truly meaningful impact an employer can make in the lives of military families. Find out the recipient of the MSJDN Members’ Choice Award at the 2015 Annual Reception in Washington, D.C. on May 6th. Tickets and information available here.